You guys, this is a pretty important episode. You may know her as Tutti del Monte if you follow her on Instagram or Sara del Monte if you know her in real life. She is one of my best friends, so I call her ‘sissy.’ This episode has quite a few inside jokes and a whole lot of laughter. I wanted to share this with you because Sara inspires me so much with her femininity, grace, patience, and humility. She has gone through a major transition in life this past year and has done so with such grace, even when plans fall to pieces. I look up to this woman for a million and one reasons and am so excited to be sharing her story with you. Sara met my ex at a housewarming party and he left the party knowing that we would be best friends. We met later at a photoshoot collaboration and It was love at first sight and we’ve been friends ever since. This time last year, Sara was single, taking time for herself, working out, and focusing on her work with her photography business Boudoir by Tutti. Our entire friend group felt a change coming, but we weren’t sure what it was going to be or who it was going to be for. She became pregnant unexpectedly while living in New York. Though this wasn’t part of her plan, she recognized that this was something she has always wanted. After doing some research and determining what it would actually look like to have a baby in New York, she decided to move home to Florida. Not being in a committed relationship with her baby’s dad, she experienced moments of loneliness and sadness. But she got to share those moments with friends, family, and community. Though she was tired through pretty much all of her first trimester, she enjoyed the experience of being pregnant. We have spent a lot of time together doing devotionals and discussing our faith. She isn’t afraid to ask questions and dig into her faith. Now that she is a mother, she experiences God through her sweet baby boy. We talk about how there are so many people praying for her baby. Going in to labor, she knew she didn’t want any epidurals. After going to a doctor appointment after her due date had passed, she was told she needed to have labor induced. Packed for a trip to the beach, she instead took a trip to the hospital to give birth. She reflects on the pain and beauty of going through labor and letting go of her plans. I’m going to end this with some advice Sara would have given herself a year ago; I think it’s probably something a lot of you need to hear right now. “Experience the process. 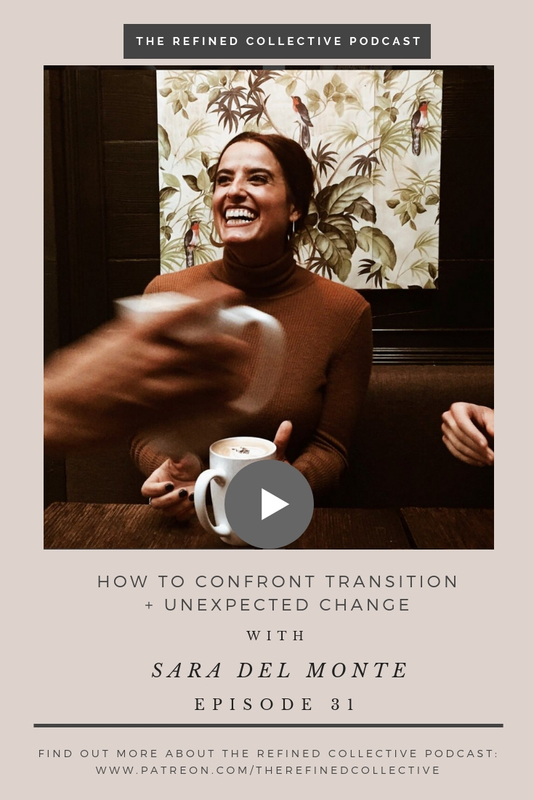 There is going to be light at the end of the tunnel.” You can keep up with Sara, her work, and her journey of motherhood on Instagram and at her website. This episode is brought to you by my free PDF guide “How to Slow Down: 6 Ways to Reset” It is so easy to rush through life. I have been challenged over the year to pause, slow down, and reset. This guide will help you to interrupt the chaos and actually find time to do more things. Go to therefinedwoman.com/freebie to check it out.